"Wisdom Personal Checks" product is already in your cart. Checks for the wise - That is who Wisdom Personal Checks are for. Coming in yellow, blue, and red with the "Om" symbol, used in chanting and meditation, on the check's center, it is evident that you have become more awakened in your life. If you enjoy practicing Buddhist techniques, are of the Buddhist religion, or you simply enjoy peaceful things in your life, then Wisdom Personal Checks can help express your desire for Nirvana in your life. 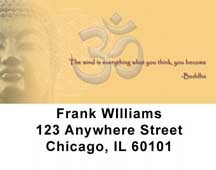 These borderless checks simply express the significance that surrounds the Om symbol. They are not too over the top, but not plain either.